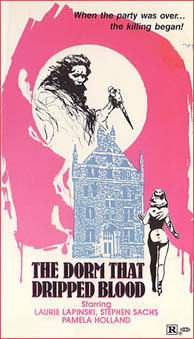 The Dorm That Dripped Blood (aka Pranks) is a joint effort from directors Stephen Carpenter and Jeffrey Obrow released at the height of the slasher craze. The cast included future Melrose Place resident Daphne Zuniga - and although the film is certainly no classic, there are enough ingredients to hook even the casual fan of the "college stalk n' kill" subgenre. Seventy-five year old Morgan Meadows Hall will soon be one college dormitory that won't be housing any more wisecracking students. Slated for renovation and future apartment living, Morgan Meadows is in the process of being completely inventoried, emptied and boarded up. Level headed Joanne Murray (Laurie Lipinski) is in charge of the massive shutdown. Eschewing time with her boyfriend Tim (Robert Frederick), Joanne has recruited a handful of students to stay behind on Christmas holiday to pitch in: Brian (David Snow), Patti (Pamela Holland), Debbie (Daphne Zuniga) and Craig (Stephen Sachs). Unfortunately, young Debbie has to bow out of the project. Her grandmother is ill and her parents are coming to pick her up for X-mas vacation. Somewhat downhearted that she won't be able to stay, Debbie nevertheless works a bit on the master inventory list. When her parents arrive, Debbie's father (Richard Cowgill) is met by a killer wielding a spiked bat who delivers several fateful blows to pop's head. Waiting in the car for her daughter, Mom (Kay Beth) too is shown no mercy as the maniac strangles her with a wire. Discovering her parents murdered, poor Debbie faints. The killer craftily drags Debbie's limp body and positions it underneath the tires of the family car. Then he takes the car out of park...and drives the auto right over Debbie's crunching bones. As day dawns on Morgan Meadows Hall, the remaining four cleanup crew find they're increasingly annoyed by local slacker John Hemmit (Woody Roll), a listless trash sifter who seems to be lurking about the grounds. Joanne schedules a pickup of the dorm's desks from local worker Bobby Lee (Dennis Ely), who seems more interested in picking up Joanne than in acquiring furniture. The group decides to try and locate John and let him know collectively their displeasure at his hanging around. But they find their search for John unsuccessful. Meanwhile...as dorm handyman Bill (Jake Jones) is washing up, the skulking menace powers up a drill. The psycho slides the tool slowly into Bill's head, blood splaying everywhere. As another night arrives, Joanne and her group prepare a decent dinner. But when someone mysteriously sabotages the feast, they decide to call the police once and for all on creepy Mr. Hemmit. Officer Lewis (Jimmy Betz) informs Joanne and Co. that a person matching John's description was just picked up. A sigh of hopeful relief. That evening, as Joanne finishes up a phone call with her parents...she hears someone on the roof. Consulting with Patty, the two decide to call the cops once again. But now, the phone lines are dead. And the electricity too goes out. A few moments later...alone in the stairwell...Brian comes face to face with the killer, who viciously slashes him in the chest. Craig and Patty attempt to restore the electricity and set out on a search for the circuit breakers. However, just as Craig reaches the box, he is knocked out. Surprisingly, Craig resurfaces at Joanne's room. Together, they discover John Hemmit lurking in the hallways. John and Craig struggle, the latter is knocked out...twice in one night! Seeking refuge from crazy John, Joanne finds refuge in a spare room...and discovers Brian's dismembered body! Bravely grabbing the machete off Brian's corpse, Joanne makes a dash out the room. John tries to stop her, but she gives him a good slashing in the shoulder. Craig and Joanne reunite and come up with a plan to escape from John Hemmit and the dorm. But before they get far, they again encounter John and Joanne successfully kills the marauder. Outside, Bobby Lee is sifting through the rubbage when he hears the commotion caused by Craig and Joanne. He sees Craig carry off Joanne and decides to investigate. Craig engages Bobby Lee and the two struggle. The police arrive on the scene and find Bobby Lee standing over a beaten Craig. Mistaking Bobby Lee as the homicidal maniac, they shoot him and help Craig to his feet. Is The Dorm That Dripped Blood a seminal slasher? No. Often mediocre production values and a nearly overwrought climax threaten to burn this little number down, but surprisingly Dorm houses a fighting spunkiness that keeps its head above water for the most part. Stephen Sachs is a decent enough stalker and common Laurie Lipinski emerges as a feisty final heroine; her literal disposal at the hands of the cold blooded lunatic (after such a game fight) is both a distasteful turn...and a sadly realistic story choice. Certainly not on par with other various campus terrors (1983's The House on Sorority Row ranks as one of the best), the gore and pace here are admirable and make Dorm worth a brief stayover, at least.